Remembering those who made the ultimate sacrifice. Wishing everyone a 4th filled with fun, food and friends….Stay safe!!! Over the weekend, my husband asked if I wanted to drive to Fort McHenry in Baltimore to visit the place where the Star Spangled Banner was written by Francis Scott Key during the Battle of Baltimore in 1814. When we moved to Maryland, the state was celebrating the 200th Anniversary of the War of 1812. There were many activities taking place in the Baltimore area and ships from around the world docked over the summer to commemorate the event. Even our license plates celebrated the event with a colorful array of fireworks and the flag. Two years later, in 2014, the celebrations began again to celebrate the end of the war. We headed out early on Saturday while it was still cool outside and cloudy since they were calling for rain later in the afternoon. I made sure to bring a hat in case the sun came out and of course it did. First, I was surprised at how small the fort actually was. 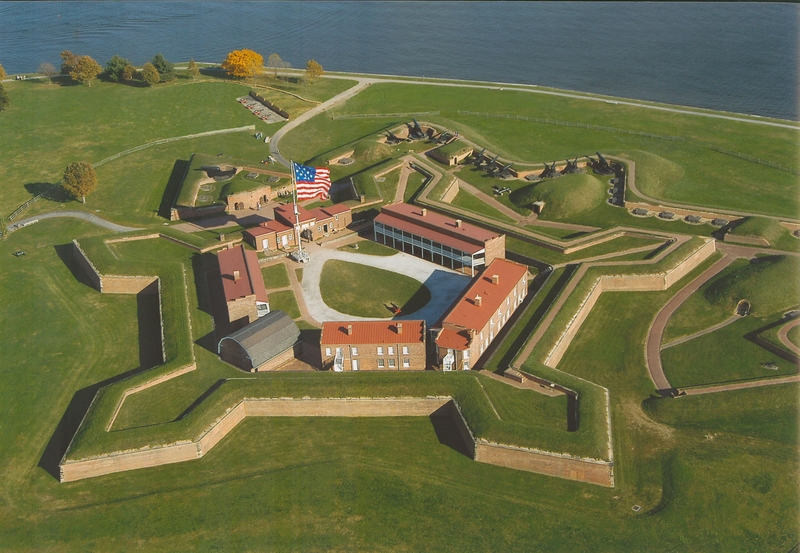 The photo above is from the National Parks Service and gives a good aerial view of the fort which is somewhat star-shaped. When you look out over Baltimore Harbor, it seems small and very close to the fort. The area surrounding the fort has been well cared for and the grounds provide plenty of benches if you just want to sit and enjoy the view. Several times a day, the Park Rangers will lower and raise the flag, and if boy or girl scouts or military veterans are present, they will ask them to help. If you want to bring a picnic lunch, there is plenty of open space to do so. The Rangers also give tours and throughout the year special events are held at the fort. There were plenty of Park Rangers throughout the area and all were willing to answer questions that anyone might have. The one Park Ranger I didn’t see was Ranger Vince, who has become something of a local celebrity thanks to his quirky personality that comes through during his frequent appearances on local television. It was just announced that he will be leaving Fort McHenry after being promoted and taking a new position in Washington, D.C. Many visitors to the fort will be saddened by this news. Nearby is the Star-Spangled Banner Flag House that tells the story of the woman who made the flag that flew over Fort McHenry during the battle. The actual flag that flew over Fort McHenry in 1814 was flown again in 2014 for the 200th Anniversary. Touring both places can take as little as two hours or longer if you want to go at your own pace. If you are near Baltimore, you might want to stop and take a quick tour. The links below will give you more information. I know that there are many variations of the tartans, but these were the two that I came across most often in my research. It has been fun learning the history of my family came from. And thank you JP, I have tartan and I am sure that there are other clans represented in my family. I will be looking for those as well. There are also castles, some of which still exist today. There is a television program titled, “Who Do You Think You Are,” that searches celebrities family trees and tells the story of their ancestors. It is produced by Ancestry.Com and the celebrity travels around the world tracing their family tree. Several years ago for Christmas, I decided that I wanted to join Ancestry.com and search out my family tree. I have limited information from my family, so I thought this would be something that could tell me more than what I already know. I know that I am Italian on my father’s side and my mother’s side was supposed to be Irish and Lithuanian. It is rather addicting at first, especially when you keep getting the hints on the branches. I started with my father’s side and quickly hit a wall. I found the ship’s passenger list for my great-grandfather (maternal side). He came to the United States from Italy when he was 12 years old and he came by himself, landing in California. He left behind his entire family. My great-grandmother (paternal side) also came from Italy and was processed through Ellis Island in New York. And that is a far back as I can find. I have not been able to find anything else for my father’s family. I was able to go farther with my mother’s side of the family. I learned that my great-grandparents (paternal side), who were Lithuanian, came to the US in the late 1880’s from the Kingdom of Prussia which is Lithuania today. But as with my father’s family, I couldn’t find anything else on them. But it was my mother’s side of the family that I was able to trace all the way back to the year 750. Some of the ancestors were historical in nature, and while I didn’t see a link to Ireland, there were definitely ancestors from England, France and Belgium, which we did not know. My first ancestor landed in the Colonies in 1650 and came from England. One ancestor was involved in the Salem Witch Trials. My five times great-grandfather came to the Colonies in 1772 from Midlothian, Scotland. His name was Andrew Balfour and I was surprised to learn that he was a Revolutionary War Hero for the Patriots. He was actually murdered at his home in North Carolina by David Fanning and his Band of Tory’s in 1782. As a history major, this was rather exiting to learn. I am also about 400 miles from where he died, so if we get to North Carolina, I will make plans to stop and visit the area. One of my great (several times) grandmothers was married to the King of England. He died and she married my great (several times) grandfather. Her parents were the King and Queen of France. Her grandparents were the King and Queen of France. And my two times great-grandmother, who was supposed to be a full-blooded Cherokee, may actually have been a free black woman from Virginia that passed herself off as Indian to be accepted. With all of this information, I learned that I am 50% Italian and the rest is made up of English (apparently we have a family crest), French and Belgian. I have decided that I am going to start researching each person on the tree and see if what my family tree tells me is actually true. It is been fun so far. First up will be Colonel Andrew Balfour. I’ll let you know what interesting things I find. My husband and I took a trip to Philadelphia over the weekend. It has been rainy for what seems like weeks and last Saturday was the one day that the forecasters said would be rain free although cloudy. With the temperatures in the low 60’s we decided that it would be perfect weather to play tourist. Of course my husband booked us on the Big Bus tour where you can hop on and off and various locations around the city so that meant it would be windy and chilly. I was surprised by how easy it was to get around the city on the weekend. Parking was no problem and once again, Pennsylvania is really clean. We arrived at the Independence Hall visitor’s center, which is a good starting off point if you are visiting the city. We wanted to do the tour of Independence Hall, so we purchased our tickets and made sure that we arrived 30 minutes prior so that we can go through the security checkpoint. Once on the grounds, the tours were scheduled for every 15 minutes and if there were seats available on the tour before yours, the park rangers would allow people waiting in line for the next tour to go in until all the seats were filled, which was nice. The rangers conducting the tour give little back stories which make the tour interesting. For me, a history major, it was cool to see where our Founding Fathers met to put together the plans for our country. And seeing a chair that George Washington actually sat in was pretty neat. After touring the actual hall, there are other buildings on the property that you can tour independently. One of them has photographs of the Declaration of Independence and the Constitution. There are signs clearly asking that flash photography not be used, but of course, there is always the one person that thinks that rule doesn’t apply to them. The park ranger continually asked one kid that had his parent’s expensive camera to stop taking pictures with the flash and he continued to ignore him. After about the fifth time, one elderly gentleman asked him where his parents were and he pointed to the people behind him. The elderly man looked at them and said, “Thank you for letting your kid ruin the documents so that future visitors won’t be able to enjoy them.” The parents thought the gentleman was rude. He replied, “What’s rude is you and your kid thinking that the park ranger asking 5 times for him to stop taking pictures with the flash didn’t really mean you couldn’t do it. What’s rude is you thinking it is okay to harm a National Treasure because your precious son fancies himself a photographer.” People around him cheered and of course the parents were oblivious. We then decided to get lunch before taking the bus tour and we wanted a Philly cheesesteak sandwich, which every tourist needs to try. While there are two legendary eatery’s that tourists flock to, those people from Philly will tell you about the little place off the beaten track that serves a great cheesesteak, and there are many, so we chose one of those to go to and were not disappointed. It was delicious and I wish I could make them as good at home. Next was the bus tour. Of course my husband had to sit on top and in the back in order to see everything. Our tour guide was wonderful and filled the tour with little known facts that you don’t find out from the history books. One was the fact the sculpture of Ben Franklin’s head was made from pennies that the school children of Philadelphia collected. Another was that tourists leave pennies on Mr. Franklin’s grave and those pennies total over $3,000 annually. The tour lasted about 2 hours, included a detour and trees that weren’t groomed for the tour buses, so we had to duck to avoid being hit by a rogue branch. But it gave us a great view of the city’s attractions and ideas of places that we want to visit the next time we go back. Once back at the starting point, my husband wanted to see the Liberty Bell up close. I had seen in from the outside, but he wanted to go inside, so while he lined up to go through security, I stayed outside and soaked up the sun that was starting to break through the clouds. Of course, that little bit of sun was enough to give me sun burn, which I was feeling the next day. We had a very nice time visiting Philadelphia and are planning a return trip. I want to visit Constitution Hall and maybe stop in at the Reading Terminal Market. That alone would fill up an entire day.